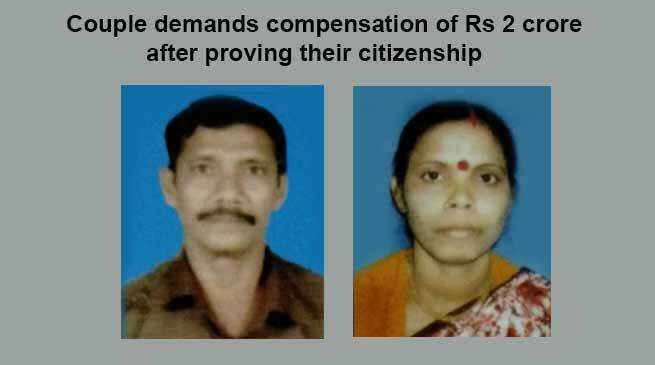 After publishing of NRC Draft in Assam, for the first time a couple has filed a case and claimed the compensation of rupees one crore each after proving their citizenship. Ratna Basak and her husband Ruhidas Basak, resident of Lumding, Assam have filed two compensation suits demanding Rs 1 crore each in the court of the Civil Judge, Nagaon against the State of Assam after the Foreigners Tribunal in Hojai gave its verdict in their favour following doubts over the woman’s nationality. Talking to NortheastIndia24 over telephone, Ruhidas informed that “a sub-inspector of Lumding Police Station had doubts over the nationality of Ratna Basak (50) and her husband Ruhidas Basak (59) , resident of Brick Field Colony in Lumding. The police station conducted an inquiry and registered a case” . Accordingly both of them had received notice on 6th July, 2017, to appear before the Foreigner’s tribunal, Hojai on 25th, August 2017 and with the documents of their citizenship. The Foreigners Tribunal in Hojai, while delivering its judgement, said the respondents – Ratna Basak and Ruhidas Basak – were not foreigners. The couple appeared before the tribunal with documents, and the tribunal awarded the verdict in their favour on 12 January, 2018. The tribunal also said that on having any displeasure regarding the case, the couple can take the help of the law of the land and move a higher judiciary. Ruhhidas wrote to the Prime Minister, Principal Secretary of the Home Department, Government of Assam, and to the ministries of External Affairs, and Home Affairs in Delhi and expressed about the incident. Ruhidas said he was born in Lumding in 1959 and got a job in the Railways in 1985. His father, Sreedam Chandra Basak, also served in the Railways from 1951 to 1985, and had voted in the elections in 1966. Further, Ruhidas said his wife Ratna Majumder was the daughter of Bireswas Majumder, a famous businessman of Diphu, Karbi Anglong, and a bonafide citizen of India. Following the verdict, an Advocate Notice on 11th April, 2018 was served to the State Chief Secretary, Director General of Police, Superintendent of Police (Border), Nagaon and to the Officer in Charge, Lumding PS, for awarding compensation amounting to Rs 1 crore to the Basak couple. Ratna Basak and Ruhidas Basak have now filed two compensation suits separately demanding Rs 1 crore each in the court of the Civil Judge, Nagaon. Accordingly summon has been issued and hearing will be on 18th September, 2018.